With the success of The Exorcist’s Meter <降魔的> and the discussions of female empowerment in pop culture, TVB’s upcoming drama The Forgotten Alley <平安谷之詭谷傳說> couldn’t come at a better time. The suspense mystery, produced by Andy Chan (陳耀全), will be succeeding the time slot currently occupied by My Ages Apart <誇世代>, and will premiere on Monday, January 15. 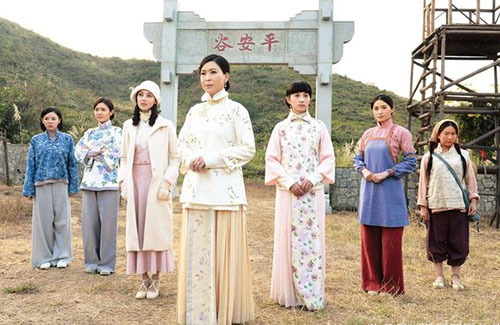 Aside from thrilling mysteries, the drama also offers social commentary on gender inequality—Louisa So (蘇玉華), Grace Chan (陳凱琳), Rebecca Zhu (朱晨麗), Katy Kung (龔嘉欣), Zoie Tam (譚凱琪), Toby Chan (陳庭欣), Jess Sum (沈卓盈), and Cilla Kung (樂瞳) as members of a village known as “The Peace Valley”, a small town in rural Guangdong where men hold power and women are deemed as second grade individuals. With Louisa in the lead, the women team up to bring down the patriarchy that had long controlled their lives. Veteran actor Lau Kong (劉江) stars as the village chief, who has four wives. Raymond Wong Ho-yin (黃浩然) stars as Lau Kong’s son, who takes the role as Sherlock to solve the mysteries surround his village and family. Yes! Finally. Katy has improved so much, Zoie and Jess too; I took forward to their performance. @iciel For someone who has been given so many opportunities as Grace Chan has, it’s pretty amazing how little she has improved since her first role. It’s almost as if she’s trying hard to be horrible. I think some people are just not suited to being actors, not matter how photogenic they are or how much they might love the job. Women bringing down the patriarchy sounds like a promising story! i’m going to give this drama a chance, i think it’ll be alright. although the actresses/actors don’t appeal to me, i really want to see katy kung because her acting has improved so much. grace chan.. only has a pretty face. Sounds good. Grace not sure. Yeah, the premise sound pretty interesting, especially the part where women team up to bring down the patriarchy. Topic of women being oppressed in patriarchal society has been done in several series in the past, but, this is the first time we see story about women banding together to turn the tide. I’ll still give Grace chances. She showed great promise in ‘Rising the Bar’, so, there’s definitely some talent there. She will improve at time goes. Sisley Choi did. Grace’s look limits her in ancient/pre-modern dramas. She fits the Western girl, but that wouldn’t be challenging if she plays that all the time. @tiffany Dilreba & Guli Nazha and other mixed blood ladies have all starred in ancient dramas before and had no problems, so I think it’s a matter of being a good actress to make them believable. @coralie Grace looked too sharp in that pirate drama. I don’t know if it’s the hairstyle or outfit, but she did not fit in. Same with her look here. @tiffany my issue with her was her voice – it was like complete cognitive dissonance when she opened her mouth. Girly, high-pitched, shrilly dialogue that I couldn’t believe came out of her. Plus her acting was over-exaggerated. Poor girl, though. I don’t know if she’ll ever live down this infamous disastrous drama. To say this drama starts quite soon, I’ve not seen much promo for it from the casts, only a few here and there from the girls, but no posts from Grace. Also in a recent promo video, it had all the girls in it but no Grace, even in the last scene where it says when it airs, there’s not even an image of her. Makes me wonder how big of a role she has in it or if it’s been cut down and she’s no longer second female lead hmm..
Trailer looks promising but the female casts are not too appealing like some already said. Besides Louisa, the rest of the females I really don’t care for. Louisa and Raymond have a lot on their shoulders.